It’s not the first time, Ukrainian Food Export Board (UFEB) have organized a joint exposition of Ukrainian food manufacturers within SIAL Paris (let us remind you that an exposition of Ukrainian representatives of meat and dairy business was organized in 2016. Ukrainian producers got a significant number of potential contacts). Considering the success of the previous exhibition, we could not miss SIAL this year. The leading international food exhibition took place on October 21-25, 2018 in Paris and on more than 215 thousand square meters gathered more than 7,200 exhibitors from 109 countries, and 160,000 visitors from all over the world visited the pavilions of food companies, including representatives of Ukrainian business. This year Ukrainian exposition presented more diverse product groups: traditional and artisan cheeses, butter, dry milk products, ice cream, pumpkin and sunflower seeds, nuts, grains and legumes, honey, frozen berries, energy drinks and snacks, poultry. Among the participants of Ukrainian Business Delegation at SIAL Paris 2018 were: Ardis Group, Milkiland, Lasunka, GraOil, M.A.R. Pumpkin seeds, Agroleader, Ascania-Pack, Med Podillia, Galfrost, New Products Group, Pan Kurchak. 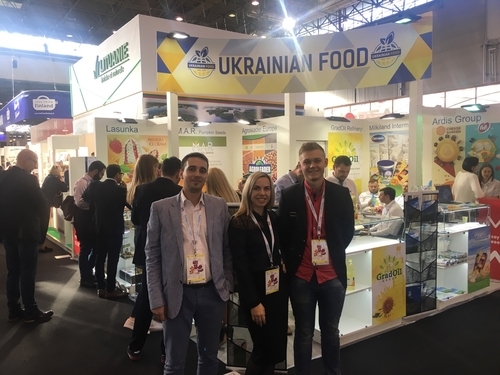 In addition to the presentation at the stand, Ukrainian food producers had an opportunity to hold direct b2b-meetings with retailers, importers, traders and other potential partners. "We already took part in SIAL Paris with UFEB in 2016. We had an opportunity to get a lot of potential contacts. When we found information about the opportunity to take part this year, we, of course, agreed and did not regret. At the exhibition, we presented cheeses, butter and dry milk products, which draw attention of the visitors from Europe and China. In general, we got a significant number of contacts; we will work with them to establish further cooperation,” Serhii Kyseliov, CEO of Milkiland Intermarket LLC. "Today, Ukrainians lack faith in their product and more ambitious goals. As the participation in SIAL Paris 2018 has shown, the quality of our artisan cheese can compete with European one. The culture of artisan cheeses consumption is especially developed in France, the originality of taste and quality have the great importance there. It should be noted that owing to the high quality and compliance with consumer request, visitors from different countries were interested in Ukrainian products. It is important that this year many more companies are ready to offer their products and take part in international exhibitions. Participation in such exhibitions is an opportunity to show Ukraine as a country, which produces high-quality products with a special recipe and taste that are interesting to foreign importers,” Dmytro Chernov, CEO of Ardis Group. As a part of the exhibition, the Forum of Ukrainian-European Cooperation took place, and specially for Ukrainian Business Delegation there was organized the Ukrainian-French Evening, which was devoted to the establishment of relations between our countries. The event was held under the patronage of Oleh Shamshur, Extraordinary and Plenipotentiary Ambassador of Ukraine to France, and with the support of Olha Trofimtseva, Deputy Minister of Agrarian Policy and Food of Ukraine for European Integration.